Massachusetts Meadow Still Going Strong! 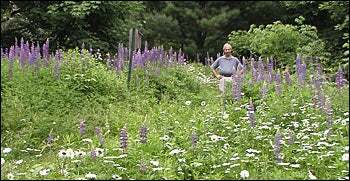 Over 15 years ago, Arlene Handschuch and Steve Kaufman sent a photo of Steve on a hill on their property in the midst of a big bloom of lupines and daisies. 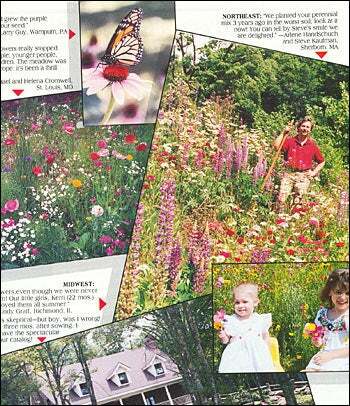 They loved their new meadow, and we loved the photo, so the next year, we published it in our Seed Catalog, which we were sending all over the country in those days. The page from that catalog showing Steve and othere success stories of the time is at right. Today, our catalog is gone (we’re internet only), but the meadow isn’t. Arlene and Steve still enjoy it every year. Here’s their story in Arlene’s recent note which she sent to us, enclosing the old catalog page and the new photo below. 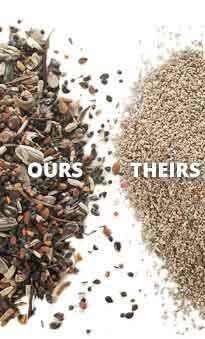 I’m sending a scanned page from your seed catalog in the early 90’s. You published a photo I sent you showing my husband standing in our wildflower meadow. I’m also enclosing a new photo showing Steve standing in approximately the same place in this same meadow yesterday. The meadow is still gorgeous; Steve’s hair color is about the only thing that has changed over the 15 years that we have enjoyed our meadow. We purchased the “Northeast Mixture”, it grew in quickly and for the past 15 years all we do is mow it down every fall. We may water it once during the summer if we have an extended drought. Needless to say, we love our meadow and thought you would enjoy seeing how well it has done for over 15 years.